At least, I thought, she’s gathered all the lies and hyperbole in one place. Theresa May’s shocking immigration speech at the Tory Party Conference left a sinking feeling in my stomach. There’s nothing she said that I hadn’t heard before, but to have it said from the platform where David Cameron would later laud Britain’s diversity and denounce racial discrimination was disappointing. Her speech flattened a lot of nuance and repeated some well-worn untruths about immigration that may feel right to some but are actually wrong. It seemed to boil down to: what have migrants given us? Nothing! What do we need to do about immigration? Stop it! And refugees are ok but while we’re at it we should stop them too. The Independent newspaper, among others, made a handy fact check of a few of the big untruths; like for instance that immigration forces wages down and people out of work in lower-paid jobs (not true) and that Britain doesn’t in fact need “tens of thousands” of migrants (look at the birth rate, guys). I won’t waste time rebutting all of those here; these arguments are well rehearsed. The truth is that if you are pro-immigration then that speech was repellent and if you’re staunchly against, then it was bang on the money. After my dismay dissipated though, I was left asking, why? Why stir this toxic pot? Some say it was internal Tory politics, Mrs May positioning herself to the hard right of the party to jockey for the leadership and appeal to the base. Maybe. I do think it was tactical, but to coin Boris Johnson’s words, it was a dead cat on the table. Shock and awe. (or shock and horror, if you’re a migrant like me). As Boris explained, if you’re in an argument where the facts are against you and you want to distract people from some inconvenient truths, you do something over the top so that people end up focusing on what you did (“Jeez, mate, there’s a dead cat on the table!”) rather than what you don’t want them to concentrate on. A dead cat on the table. A flashy speech on an emotional issue is a useful distraction from things like the cuts to tax credits which will leave the working poor even worse off and which even the Sun came out to criticise in the run-up to the conference. The reason why tax credits are needed to subsidise the low wages paid by corporations are never mentioned by Theresa May, nor how these cuts will actually make people’s lives harder –but migrants are. This also keeps the focus off policies which are making an unequal Britain even more so and dismantling national treasures like the BBC and NHS. The migrant is, as always, the scapegoat. Something else the speech did was to set the stage for some exceptionally bad policy making that’s coming up this week: The Immigration Bill. Only a year after the last Immigration Bill, and, uncomfortably for Mrs May, just over a month since immigration figures were shown to reach a record high – which, as immigration is always framed as a problem – means that Theresa May isn’t doing very well at her job. All things considered, she needed to talk up the “immigration problem” so that the Immigration Bill can be presented as a solution. Even though, among a raft of other measures aimed at making the UK a hostile environment for migrants, there are the landlord checks, which experts say will increase discrimination in the private rental market for anyone who looks or sounds foreign, or who has a foreign name. It will contribute the racial discrimination that David Cameron rightly denounced in his speech. I was disappointed by Theresa May’s speech and shocked by her tone. But I was not surprised by her cynical move. 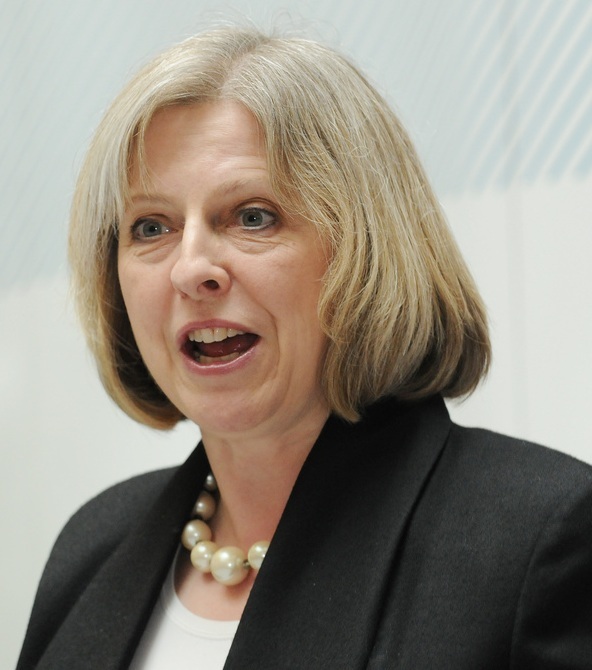 In 2011, in a speech aimed at undermining the Human Rights Act, she claimed that a man had avoided deportation because of his pet cat. This was untrue, as legal blogger Adam Wagner explained in the Guardian, but anecdotes that reinforce prejudice can be politically useful, as we saw last week. And when it comes to cats, Theresa May has form.